Extreame Savings Item! Save 45% on the Jolt Gear Hoodies for Women - Pullover Hoodie Running Top - Light Weight Dry Fit Fabric - FREE TOWEL INCLUDED! by Jolt Gear at Lamont Design. MPN: jg-whoodies-ablk-lg. Hurry! Limited time offer. Offer valid only while supplies last. The Jolt Gear Women's Performance Hoodie - At Jolt Gear, we're known for using the latest tech and innovative fabrics; this hoodie is no exception. The Jolt Gear Women's Performance Hoodie - At Jolt Gear, we're known for using the latest tech and innovative fabrics; this hoodie is no exception. This workout hoodie has a unique polyester fabric that makes it breathable, soft, and great at wicking sweat. With so many attractive features, it's clear to see why women love to wear this aesthetic hoodie. Only found at Jolt Gear, this cute hoodie is crafted from a polyester material with a beautiful heather tone. Whilst looking the part, the hoodie still retains the excellent moisture-wicking properties of a typical Jolt Gear clothing item. Jolt gear's hoodies are built for sporting activity, but that's not their only purpose; these hoodies are also ideal for everyday casual wear or layered with other clothes. The pullover hoodie is finished with a colored trim around the hood and cuffs, resulting in a hoodie that looks as good as it feels. Lightweight and breathable, this exercise hoodie keeps you at the perfect temperature, whatever you're doing. 4-way stretch material gives you the freedom to move in all directions, while the sweat-wicking fabric further supports athletic performance. Perfect as your sporting attire or as leisure wear. Getting fit doesn't have to be unfashionable - Grab it today! Our promise to you! In the unlikely event that you're not satisfied, we'll replace your hoodie, or you can return for a full refund. STYLISH, EYE CATCHING WORKOUT TOP - This warm, stylish, and favorably fitted long sleeve hoodie for women, was perfectly crafted from a unique polyester blend. This lightweight shirt wicks moisture and is wonderfully flattering and available in four colors. Ideal for running, walking, yoga, sporting activities, and even can be worn for those casual days with a pair of leggings or jeans. SOFT, LIGHTWEIGHT AND HEATHER TONED - With a beautiful heather tone, contrast colors on the hoodie and cuffs, V-neck, and a classic pullover design, this modest top gives you the same comfort you'll find in a traditional hoodie, while simultaneously performing as an effective dry-fit performance item. 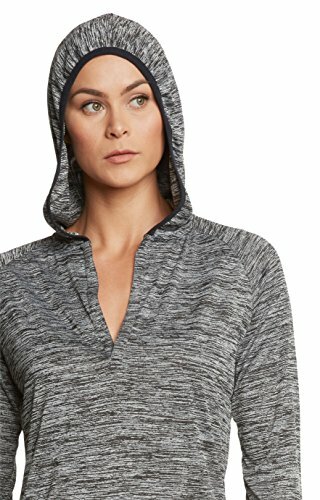 STAY WARM OR COOL AND DRY - With sweat-wicking fabric, this lightweight hoodie is the perfect addition to any woman's wardrobe. Can be used as a layering piece to keep you warm during those chilly months of the year or cool and dry when the temperatures begin to rise. You'll find this thin pullover to effectively keep your skin cool and able to breathe. 4-WAY STRETCH FABRICATION - Experience enhanced mobility during any of your workouts. Whether you're taking a brisk walk, going for an intense run, lifting weights, stretching, or performing an activity that requires you to be mobile, you'll find these workout clothes to support pretty much any activity. You're sure to love this one. ANTI-ODOR TECHNOLOGY - This athletic v neck hoodie utilizes fabric technology that prevents unwanted odors and bacteria from forming - allowing you to stay fresh all-day long. If you have any questions about this product by Jolt Gear, contact us by completing and submitting the form below. If you are looking for a specif part number, please include it with your message.